The decor highlight, Pixel Lounge. All photos courtesy of Almaha Marrakech. A new boutique hotel is straddling the line between old-world riad and new-world accommodation in the middle of Marrakech. 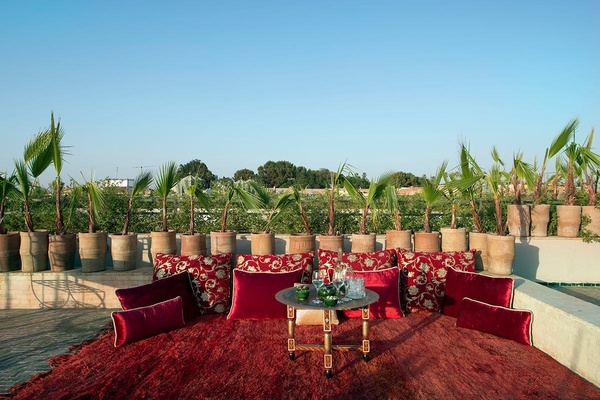 This February, the oldest neighborhood in Marrakech got a welcome addition with the opening of , a designer boutique hotel with resplendent courtyards hidden behind vast wooden doors down a quiet side street in the Kasbah district. 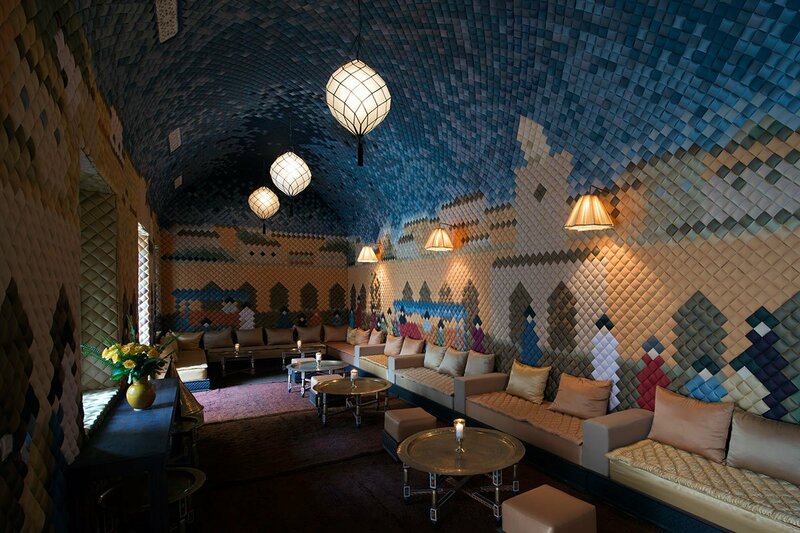 The hotel is a cross between a classic riad and the western-style hotels that have become something of a new trend in the city. 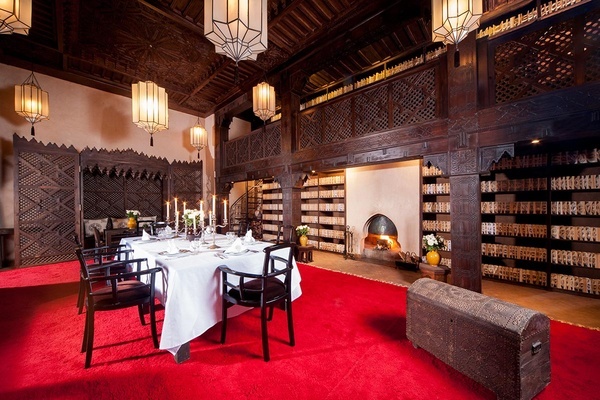 The owners lovingly converted two buildings, which includes the nearby Royal Palace's livery stables, into a stylish retreat with tasteful Moroccan decoration and inventive design. Inspired by Baudelaire's poem, "Invitation au Voyage," Belgian architect and interior designer Charles Kaisin modeled the space using unique modern touches that complement the traditional craftsmanship found throughout the property. 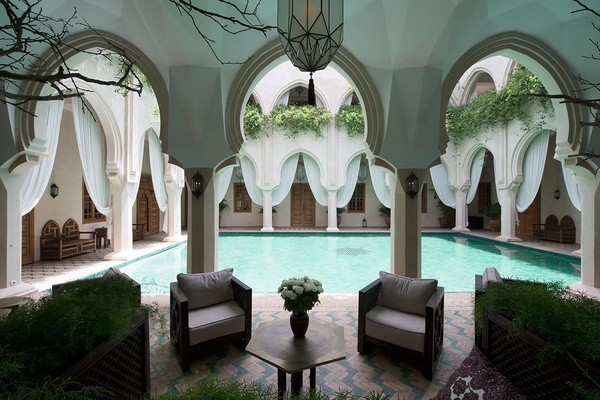 The main courtyard has a vast decorative pool and sweeping white curtains that hang from the overhead balcony, along with two large seating areas to enjoy tea or drinks. Various rooms lead off the courtyard, including the exquisite Pixel Lounge, which is lined with interchangeable tiny silk squares that create a dreamy pattern of colors on the wall (reminscent of traditional Moroccan tiling), the beautiful library-style dining hall, a swimming pool in a secluded private courtyard with two sun loungers, and a sprawling roof terrace with views of the Atlas Mountains. 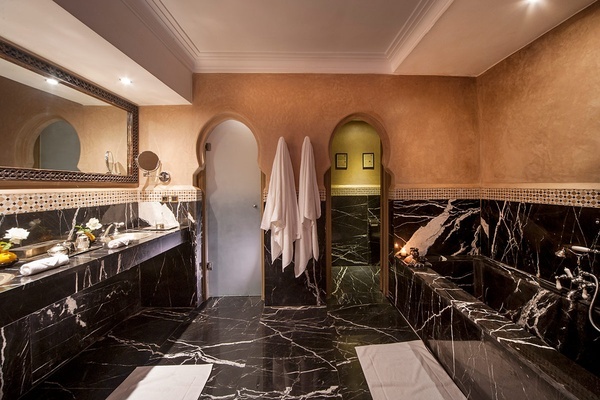 Steps lead down to a gorgeous spa with plunge pools, jacuzzis, loungers, treatment rooms, and a hammam. Fresh salads, Moroccan staples, and scrumptious tagines, or traditional stews cooked slowly in clay pots. Upon request, the chef made me a beautiful fish cooked in foil with fresh salads for dinner and simple omelettes for breakfast, served with gluten-free bread and goat cheese, which they crossed town to find. The hotel has twelve rooms, including a number of tasteful suites with fireplaces and living rooms that function as heavenly mini-apartments. It is hard to go wrong with any of the hand-crafted interiors, with their hand-polished walls, marble bathrooms, and artisanal touches. But top of the crop are the senior suites with private terraces that measure 63–67 square meters. My junior suite was a luxurious mini-apartment with a living room, bedroom, lavish bathroom, and roof terrace. The interiors were lovely: sand-colored walls, h rugs, a fireplace, a desk, candles, and a sofa. The bedroom decor included old Moroccan artifacts on the walls and romantic latticed window shutters. The bathroom was like a private marble spa with a big tub, a shower, generous sink space and counters, and a steaming area. Anyone who loves great design and likes to get away, feel at home, and be pampered when asked but left in peace otherwise. Those on a budget. Those with limited time for relaxation. The Kasbah, part of bustling old Marrakech, is a stone's throw from the main square . The square really comes alive at night, with pop-up food stands, entertainers, and throngs of people. Like the rest of the old town, the Kasbah is generally lively and old-world. Men push donkey carts or sit drinking tea in cafes. There hotel is surrounded by souvenir stores, local shops, and other riads, which makes for lots of foot traffic, but not as much as in the main square or medina. At night, visit Jemaa-el-Fna. By day, head to the surrounding souk to buy artisanal wares or to for furniture. Check out the opulent hotels and and nearby palaces like . Visit , a garden and royal home that just opened to the public, or drive out to the , a new garden just outside Marrakech with art by Picasso and Keith Haring. Rates start at €320 per night. .